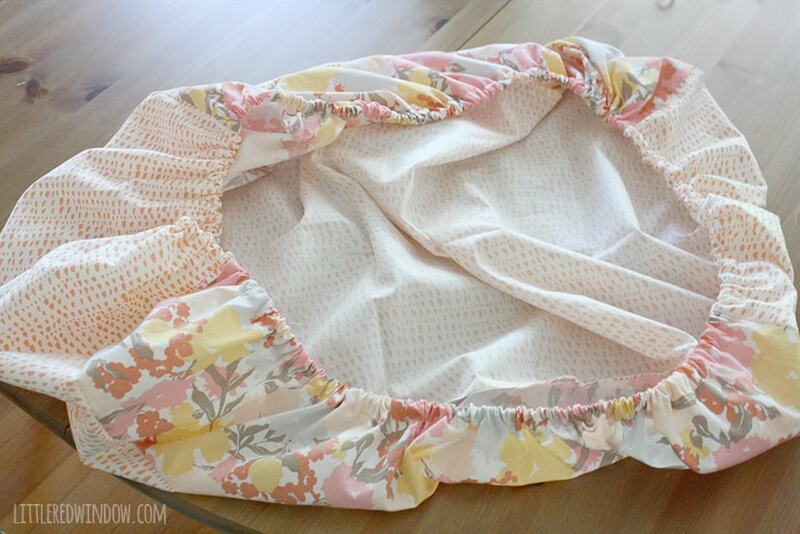 You won’t believe how easy this diaper changing pad cover is to sew yourself! I think I will start this project off by saying, do yourself a favor, make more than one of these. I mean, knock on wood, O did not tend to make a mess in the middle of diaper changes all that often. (I’m sure that means that baby #2 will make up for it because now I’ve jinxed it, don’t you think? I mean, it did happen a few times, but almost always to dad–way to go kid! ha!) 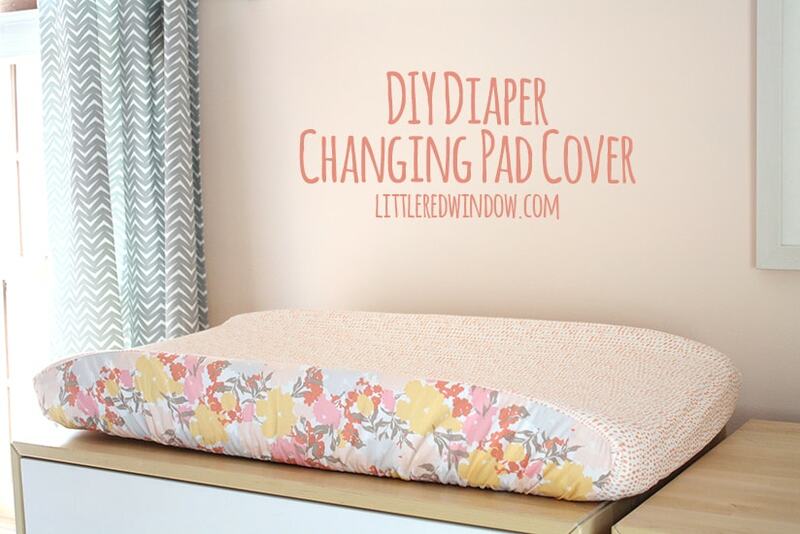 But seriously, I have heard enough diaper change explosion disaster stories from my mom friends to say, you are going to want more than one changing pad cover. Even if you think you won’t. Just do it. But the good thing is, they’re so easy to make, it’s not a big deal! I am not making a backup because since we got lucky with O, the one we used in his nursery, while it doesn’t match the new room at all, is quite clean and perfectly usable for the times when the new cute one is in the wash. And actually, I almost didn’t even attempt this project because I assumed it was going to be a pain. But isn’t that always the way it is? The projects you think will be easy take nine million years and a bunch of swear words, and the ones you think will be a pain, turn out to be a breeze. Perhaps, I should just always think things are going to take forever? Pessimistic crafting? So anyway, when I just could not find one I liked in a store, I decided, might as well have it match the rest of the nursery perfectly and use my own fabric, right?! Right. And anyway, as it is with second babies, we are barely buying this kid anything new at all so I feel ok with a few frivolous handmade nursery details. We’re reusing all the same carseat, furniture and curtains, bibs, blankies and even most of the baby clothes. I have no problem dressing a girl in blue and airplanes. Who cares? So something a little pink and girly is nice to balance that out. But back to the changing pad cover, I designed mine to be made with two different fabrics because I wanted it to have contrasting sides. 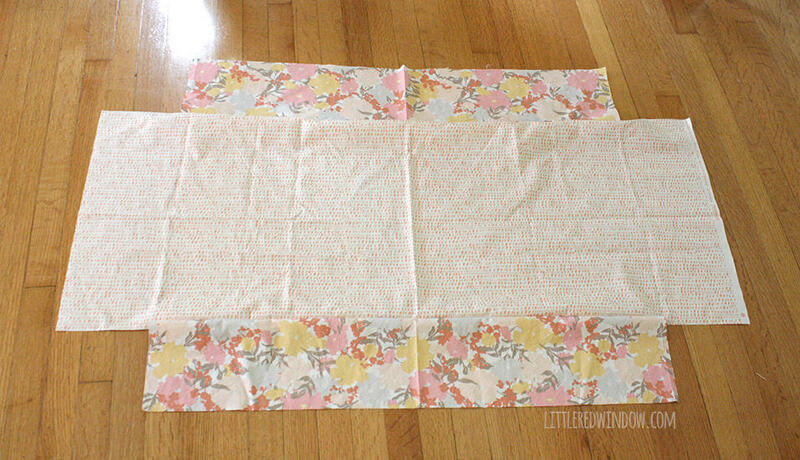 If you make this out of just one fabric, ignoring the first steps, it’s even that much easier. But be warned, it turned out so cute, I kind of want to make a bunch more and some crib sheets (it’s the same basic process) too! I might start giving these as gifts! 3/4 yard of main cotton quilting fabric. You could also use something like terrycloth for extra absorbency. 1. First I measured my changing pad and drew a little sketch. I think they are a standard size but don’t quote me on that, measure yours to be sure. 2. After you pre-wash and dry your fabric, cut out one main piece and 2 side pieces. 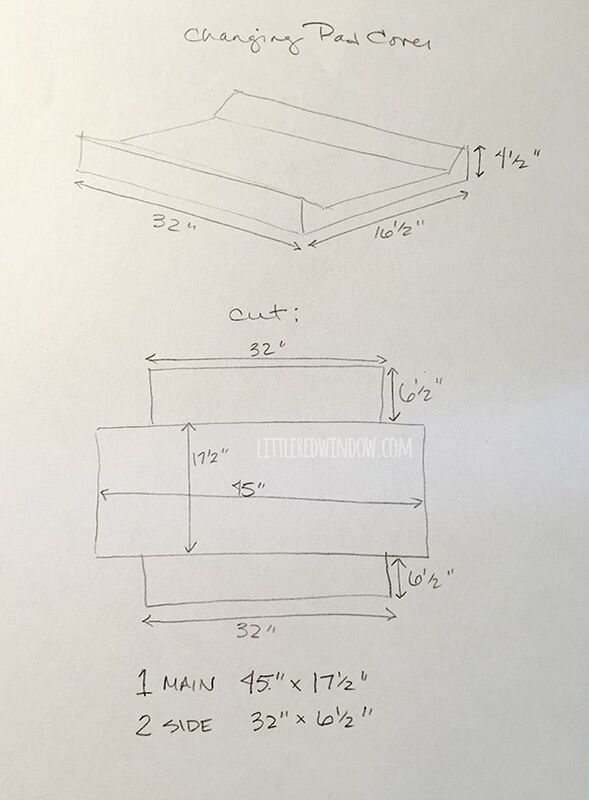 If your measurements aren’t the same as mine, note that I measured the width of the changing pad and added an inch (in addition to seam allowances) to account for the dip in the middle. 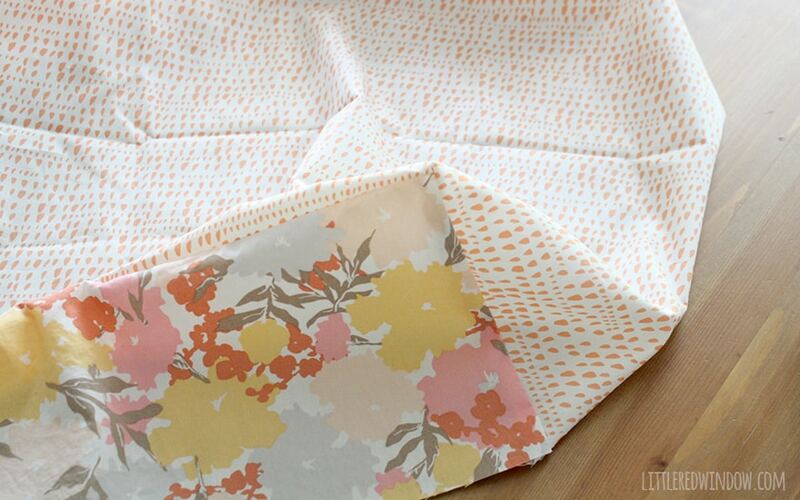 Once your pieces are all cut, fold them all down the middle and press to mark the center. Then lay the main fabric out right side UP. Lining up the centers, lay down the side pieces right side DOWN on top as shown. Pin. 3. 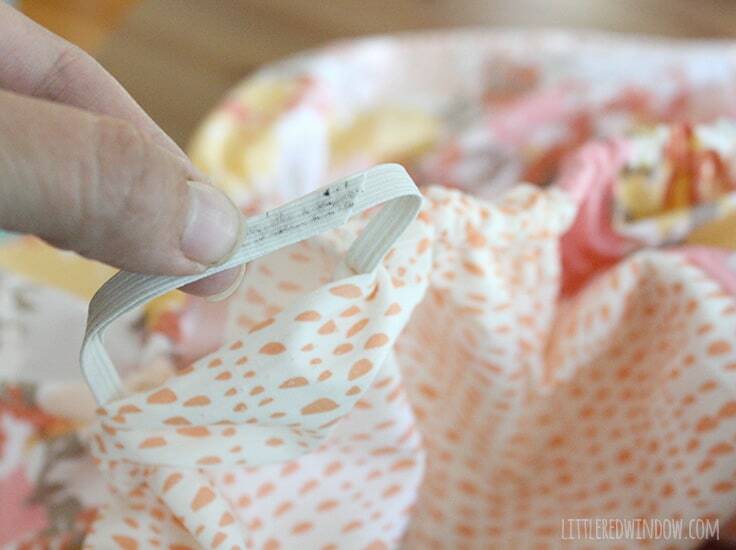 Sew along the edges of the side pieces using a 1/2″ seam. Make sure to start AND stop about 1/2″ from the ends of the side pieces. This will allow you to box your corners in the next step. 4. Unfold your cover and press. 5. At one corner, bring together the short sides right sides together and pin. (Bring the blue lines together) Then sew with a 1/2″ seam. This will create a boxed corner. Repeat with the other three corners. 6. 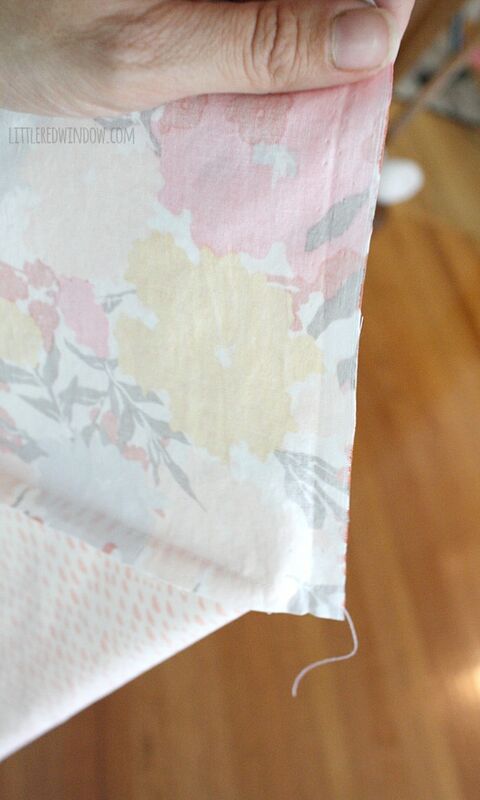 Turn the cover inside out and using an iron, fold up the bottom edge about 1 inch all the way around and pin. This will be the channel for the elastic. 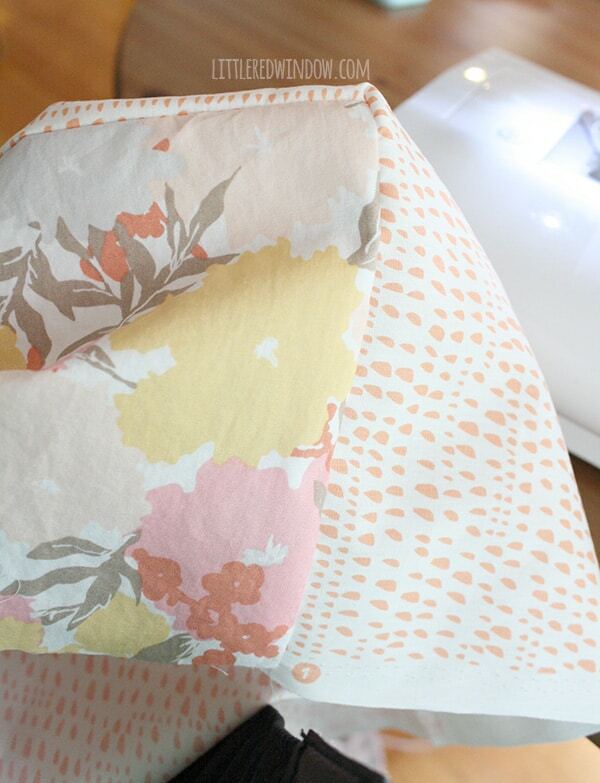 Sew this seam, close to the fabric edge, all the way around leaving about 3″ open to insert the elastic. 7. Using a piece of elastic longer than you’ll need, stick a safety pin through one end and use that to feed the elastic through the channel all the way around until it comes out the other side. Try to keep it from twisting. 8. 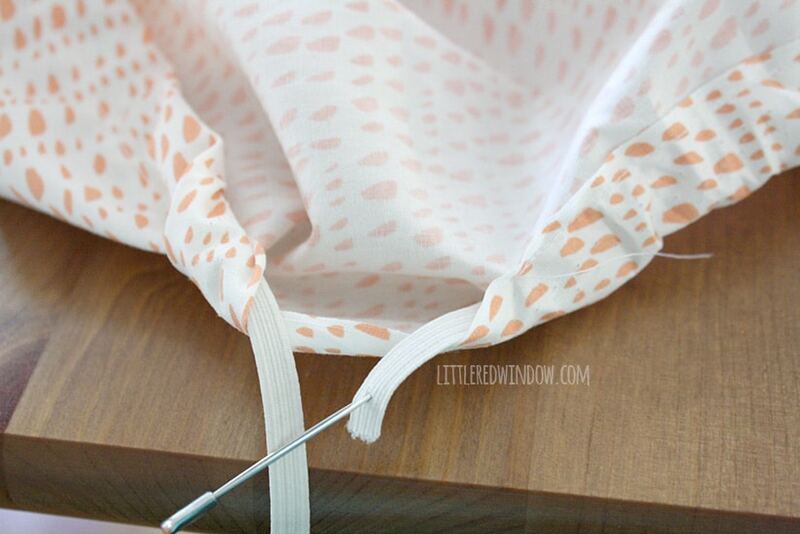 Pull the elastic out until the elasticized bottom edge of the cover is as gathered as you want it. (this depends on how stretchy your elastic is and how tight you want your cover.) 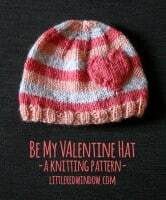 Cut the elastic, overlap the ends by about 2 inches and then sew them securely together with a zigzag stitch. (I don’t know why my elastic looks dirty, it was seriously like that just at that one spot! Annoying!) 9. Once the ends of the elastic are connected, let them go and they will pull back into the channel in your cover. 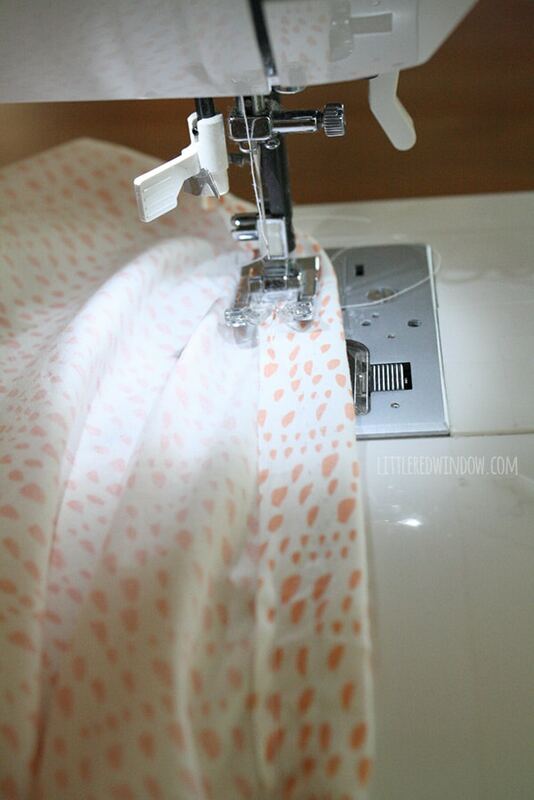 Then use your sewing machine to close up the opening you left for threading the elastic. And that’s it! 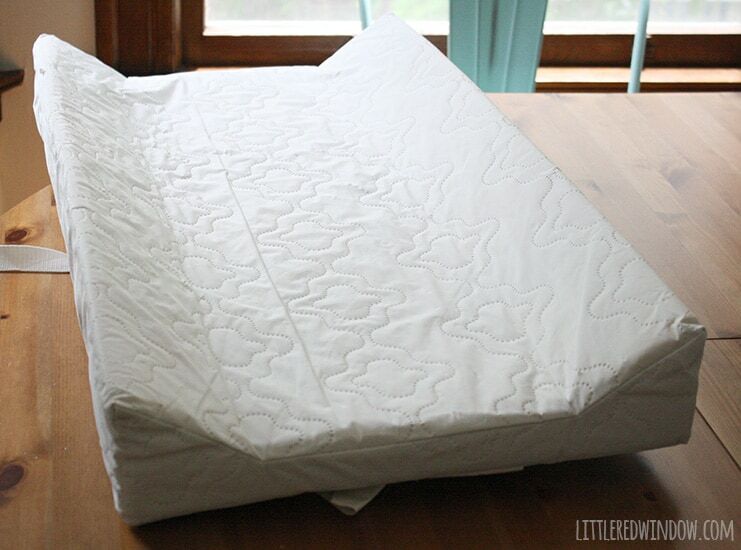 Your changing pad cover will look pretty much like a fitted bedsheet (which is why you could use this same tutorial to make crib sheets, just measure the mattress instead!) 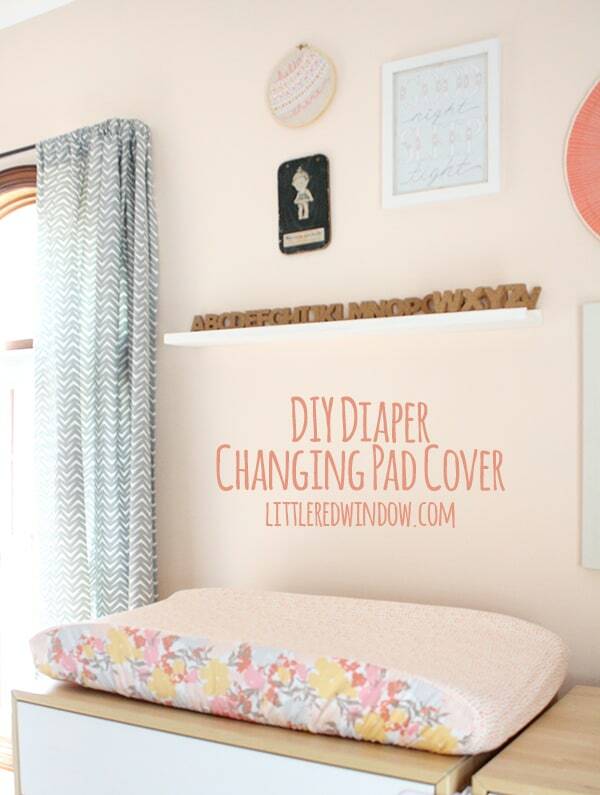 and it should fit your diaper changing pad like a glove! If it doesn’t quite go all the way down in the middle of the pad, don’t worry, the minute you put baby on it, it will conform! And you’re all done! A note about the photos, my changing pad is anchored to the dresser top in back with the safety strap that came with it. Always attach yours so it doesn’t slide off. And there are also safety straps for the changing pad to strap the baby in (don’t leave them unattended of course) I just tucked mine underneath to make the photos prettier! They come out from the bottom and just go around the changing pad cover. 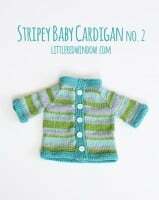 There’s really no need for button holes or anything to thread them through. So in love with that flower material that you used on the side! 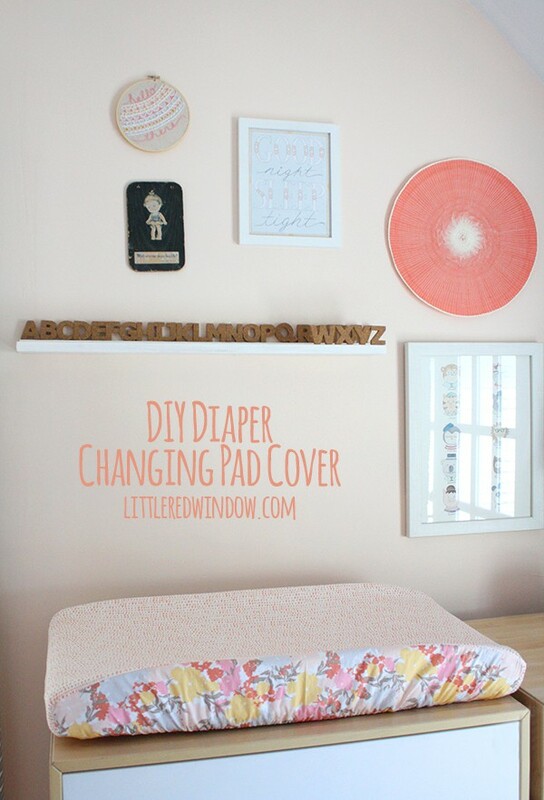 This is so much more exciting than the standard changing pad covers! 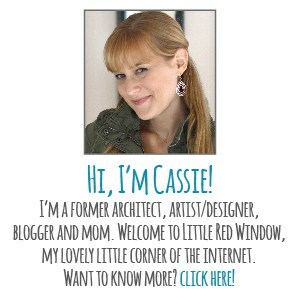 Really feeling inspired to go and make a pretty boring area in my daughter’s room a bit more colorful and exciting!